Sake, Japanese rice wine, or Osake as it is called in Japan is a type of liquor made primarily from rice or rice-malt that contains around 15 percent alcohol content. Besides having high amounts of vitamin B6, it has no other trace nutrients to mention. 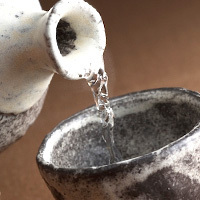 Traditionally, sake is drunk hot in cold regions in Japan during the winter. When sake is drunk hot, it is referred to as atsukan or hot sake. The calories in Sake per 180g(1shot) is 196 calories. Sake is calculated to be 109Cal per 100 grams making 80Cal equivalent to 73.39g with 8.82g of mostly carbohydrates、0.72g of protein、0g of fat in 180g while being rich in vitamins and minerals such as Vitamin B6 and Molybdenum.